Legend of the Five Rings: The Card Game and its Organized Play have enjoyed a fantastic first year. The game sold out at Gen Con Indy, and the Kiku Matsuri event drew hundreds of enthusiastic samurai whose battle cries rose well above the din of the crowd and reverberated throughout the Event Hall. We saw Launch Parties held around the globe. 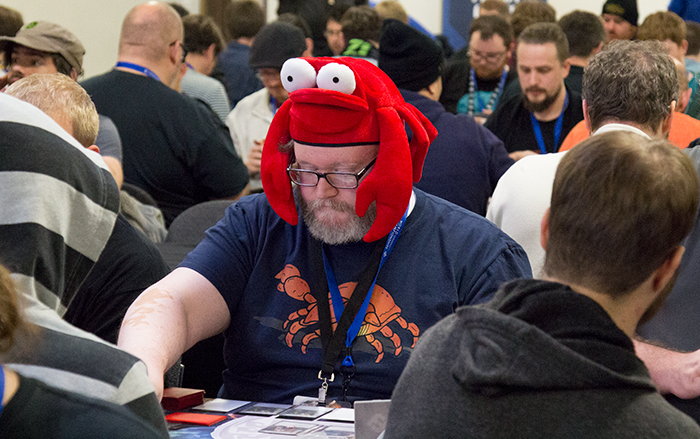 The excitement surged forward as champions from each of the Great Clans converged on the Fantasy Flight Games Center for the Winter Court World Championship. In turn, the Winter Court World Championship saw Lion Clan hero Samuel Benies appointed Shogun, and he resolved the dilemma set forth in the story The Fate of Flames by convincing Matsu Tsuko to pursue the path of justice, releasing her Crane prisoner to pursue the death of Crane champion Doji Satsume. The Winter Court World Championship also saw the determination of the clans' elemental roles, setting up the Toshi Ranbo Kotei series, which has proven a tremendous success, drawing countless players to high-energy events hosted throughout the United States and Europe. Recently, we've seen fans carry the excitement from these events back to their friendly local game stores to participate in the Battle for the Stronghold, as well as the tournaments and leagues they've run with the Season One Stronghold Kit. 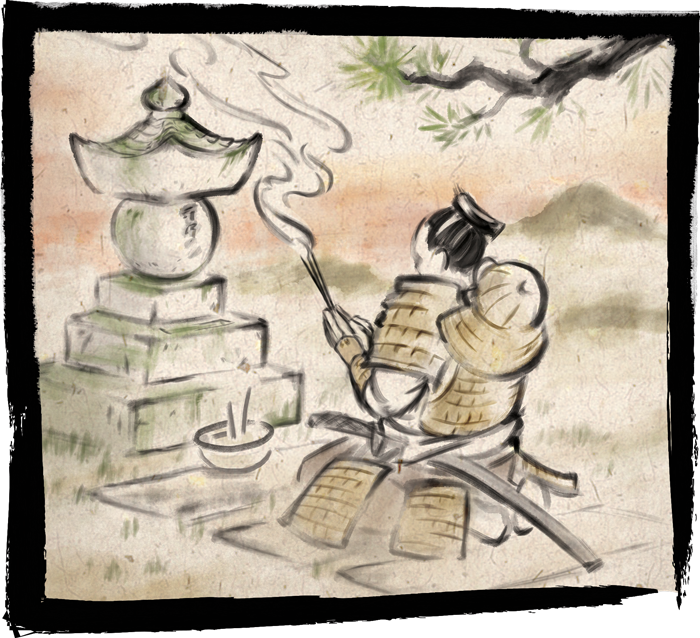 Now, as we look forward to the Season Two Stronghold Kit—and the next season of Legend of the Five Rings: The Card Game in-store play—we want to turn our gaze for a moment toward the next generation of samurai. 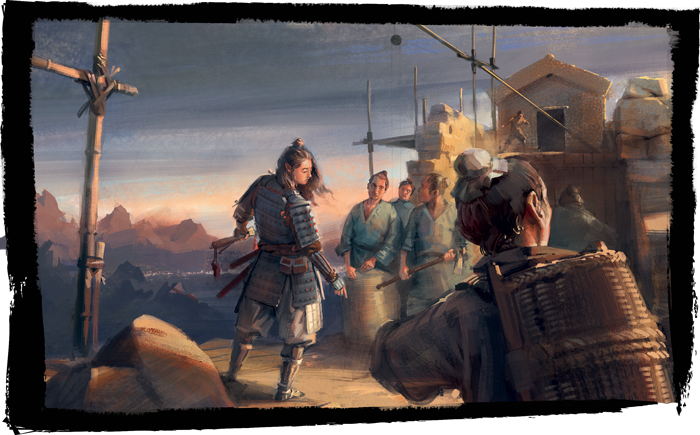 After all, Legend of the Five Rings Organized Play plays many roles, and while it provides veterans with a chance to clash on any of Rokugan's numerous battlefields, it also serves as a training ground for Rokugani looking to learn the ways of the bushi, shugenja, and courtier. And while the game's growth—and the growth of its community—may benefit from its Organized Play, they rely heavily on one of the game's most important and oft-unsung players—the Event Organizer. Today, guest writer Tobin Lopes looks at how you can help grow the Legend of the Five Rings: The Card Game community, as well as the ways you might be able to incorporate the contents of the Season Two Stronghold Kit into your efforts! Tobin Lopes lives in Denver, Colorado with his wife Brenda and their kids, Ezri and Zachary. He is co-creator of The Art of WarCast – a podcast about Legend of the Five Rings. He would like to thank Jason Wallace, who also contributed to this article. Legend of the Five Rings is an amazing game. It’s strategic, diverse, engaging, and most of all, fun! It’s even more fun when you can share those elements (pun intended) and your experience with others in your Friendly Local Game Store (FLGS). This seems obvious. What might not be obvious is how you can use the Organized Play program to grow your own local community of players. I’ve built three communities around LCGs®, including Legend of the Five Rings, and through trial and error I’ve come up with some winning strategies. Growing your local community starts with you. If you don't show to your FLGS, then no one can join you. I’ve found success begins simply by showing up. Talk to your FLGS, and determine a day and time when they have space available (maybe there’s an LCG night). You should commit to attending for at least a month—if not longer. Then show up each week and be available to play the game and teach it to anyone who asks. Ideally, the store can put up a poster from the Stronghold Kit, add the day to their online calendar, and share through their social media efforts. Don’t be shy either! You should use social media and gaming sites to make yourself easy to find. The most important thing, though, is that you are at the store each and every time until a stable group exists. I played Android: Netrunner with one other friend for about two months until more people started showing up regularly. Soon we had eight to ten regulars. Success! In addition to being present, you need to be ready. Build a couple of decks that play together well and show off the various themes of the game. I personally think Crab, Crane, Dragon, and Lion are best for this, as they offer fairly straightforward lines of play and don’t have complex timing windows. You’ve committed to a place and time. You have some decks. You’re ready to go. You’ve been strategic with your decisions. Now you need to engage with diverse and unpredictable forces—other people! In this day and age, many different people come into your FLGS. The two types of people you’ll most likely encounter are those who already know the game and want to play, and those who might be interested simply because you’re there. When you encounter an interested person, remember that the easiest and simplest gestures are still the most powerful. Introduce yourself, and offer a handshake. Say, "Hi," and smile. If the person is a current player looking to play, then sit on down and play… yay! If that isn’t the case, and they ask about the game, then tell them about it—but don’t assume anything. The best way to start is to find out what they know—especially it they are familiar with customizable card games. Depending on what they want to do, I recommend going through a quick turn or two of the game. During those turns, you should keep one goal in mind: communicating how fun and diverse the game is. But beware of specialized terms like Lion Swarm or Crane Control! These insider terms can confuse things. Instead, keep things simple, and be sure to give the person something if you can—a full-bleed card from the Stronghold Kit or Reinforcement Pack is ideal, but anything you have is good. Your priority is making things clear and fun! Flash forward to a month or two later. You’ve got a stable group of at least four or five players. You have all played regularly and developed a greater rapport and love for Legend of the Five Rings. At this point, if you haven’t already done so, it’s time to take the next step and schedule a tournament. Nothing huge, though. You’re just looking to introduce your group to organized competition. Consider this event the Grand Opening of your FLGS "Stronghold." Now, card tournaments can sometimes be intense, and the last thing you want to do is burn out your group. I suggest a casual tournament of three-to-four rounds of Swiss-style pairings and then call it a day. You might consider creating some clan versus clan rivalries by keeping track of clan versus clan records. You might also take honor counts at the end of each game in order to name a most honorable (e.g. Lion) and least honorable (e.g. Scorpion) clan. Whatever you choose to do, be sure and entertain all ideas. FFG’s Organized Play kits offer suggestions and expectations, but they also leave you a good deal of control over what you do—so you should do what’s best for you and your group. Remember: your focus should be on fun competition. After your event, be sure to reflect and evaluate what went well and what can be improved. If you’ve been successful with your meetups and event, then you should have grown a good, fun, and interactive community around this game in your FLGS. You have completed building your Stronghold. Success! Now you move from building your group to energizing it, and hopefully seeing more growth. 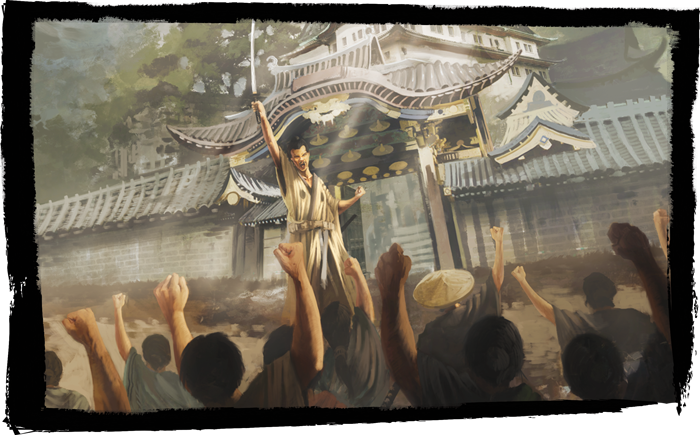 There’s one thing that most LCG players love—change! While the regular release of cards typically provides change enough, sometimes your group will want more. Coming up with some different ways to play the game is a great way to do that. For instance, try flipping the roles that players use to build their constructed decks—keep each clan's current elemental role, but suggest a deck with a Seeker instead of a Keeper role, (or vice versa) and see what they discover. Another change could be to encourage casual play, where all players are told to bring a deck with any role of their choice. Another option is to run a league, tournament, or series of events where the winner is named your FLGS’s Magistrate. You could even get your FLGS to post the Magistrate's name on their website for honor and glory! As long as the title (in this case, "Magistrate") works to encourage play and fun between players, you can be as creative as you want. Perhaps each of the players that provided the most victories for their clan at the conclusion of your Battle for the Stronghold event or seasonal league could be named that clan’s Magistrate (i.e. Tobin Lopes, Crab Clan Magistrate… yeah, I like the sound of that). Again: fun is the goal. Now, this might be obvious but none of the above can happen without good open dialogue with your FLGS. As Fantasy Flight Games Organized Play offers their kits, you want to be sure and talk to your FLGS about what’s best for you and your Legend of the Five Rings community. Our groups tend to like smaller leagues with the occasional tournament, but your group may be different. You won’t know until you get started, and that means talking to your FLGS. If you don’t know who to talk to, ask, and maybe you can be the one that gets it all going. Creating, building, and sustaining a community takes time, resilience, a bit of strategy, and being engaged. It may sound daunting, but time passes no matter what we do—so why not have fun and share that fun with others? It’s work, yes, but the reward of having an engaged and fun gaming community is worth it. 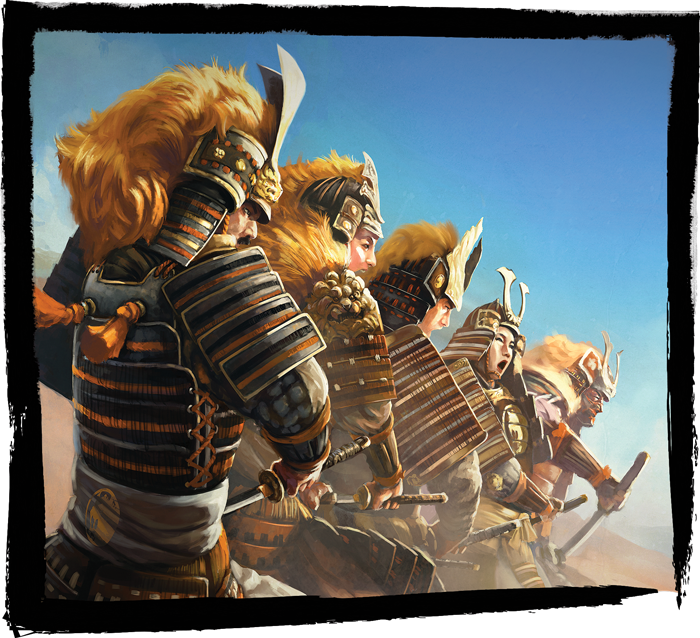 Your clan's path to power starts with the development of a powerful army. Then, after you build your local playgroup, you'll find many twists and turns along the road to the Imperial Palace—with some of them coming your way very soon! 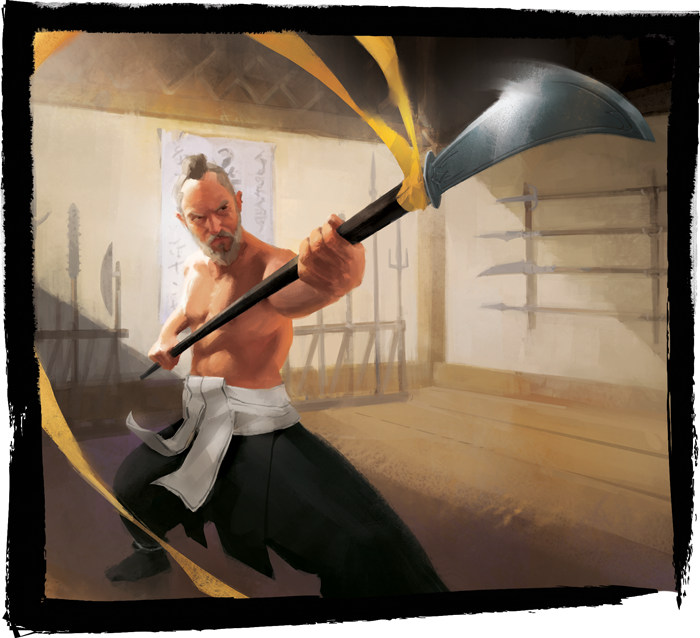 Keep your eyes peeled for more information about the Legend of the Five Rings: The Card Game Organized Play program—including some exciting new changes and additions!